Okay, so I really haven't done all 11 tags on Tim's 12 Days of Christmas Tags, but here is the one I created for day 11, with some modification. I used the Ave Maria Set from Artistic Outpost, the "joy" is from SU's set The Snowflake Spot. Be sure to check out the other great stamps at Artistic Outpost. It's the first holiday season at the Outpost, and Robyn's got some specials to celebrate her grand opening! 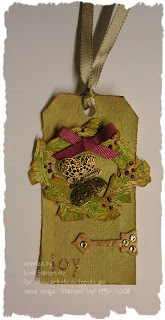 Be sure to check out fellow Artistic Outpost Design Team Member, Gerrie Johnnic's Blog - she's been doing a lot of Tim's 12 Days of Christmas Tags, with sets from the Outpost! Love the tag, it's so pretty! Like your new picture too!